The caravan with the Landsat Data Continuity Mission spacecraft arrived at Vandenberg Air Force Base. 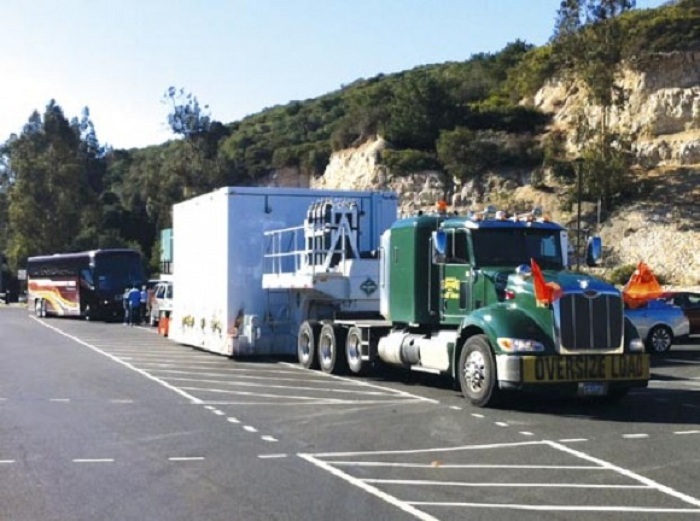 An oversized semitrailer has brought NASA’s Landsat Data Continuity Mission spacecraft to Vandenberg Air Force Base in preparation for the satellite’s trip to space in early 2013. The satellite, built by Orbital Sciences Corp., will continue the Landsat mission of providing images of Earth’s land, oceans and other natural resources. At Vandenberg, it will undergo preparations for a launch Feb. 11 aboard an Atlas 5 rocket. Liftoff is planned between 10:04 and 10:48 a.m. from Space Launch Complex-3 on South Base. This will be the eighth satellite in the Landsat series of spacecraft since the first one flew in 1972. The NASA and U.S. Geological Survey mission will continue a 40-year record of measuring changes on Earth from space. “It will extend and expand global land observations that are critical in many sectors, including energy and water management, forest monitoring, human and environmental health, urban planning, disaster recovery and agriculture,” NASA officials said. The satellite will undergo additional testing at Vandenberg before being attached to the Atlas 5 rocket. Tucked into a shipping container, the huge truck bearing the satellite left Orbital’s Gilbert, Ariz., facility on Dec. 17. “LDCM builds on and strengthens a key American resource: a decades-long, unbroken Landsat-gathered record of our planet’s natural resources, particularly its food, water and forests,” said Jim Irons, Landsat project scientist at NASA’s Goddard Space Flight Center in Greenbelt, Md. 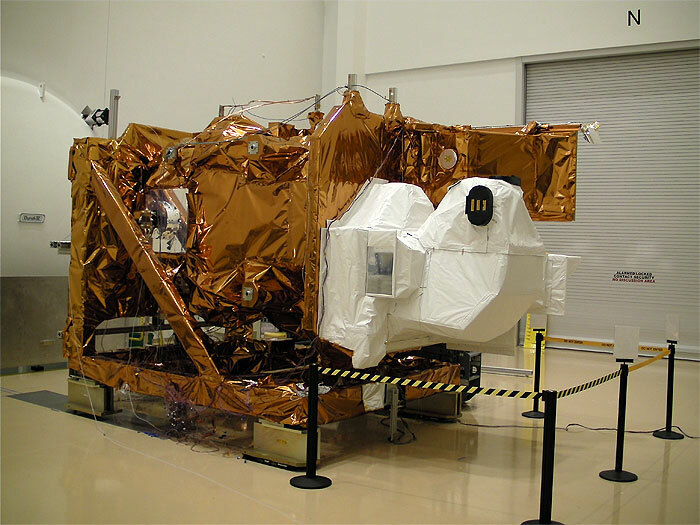 LDCM actually carries two instruments, the Operational Land Imager built by Ball Aerospace & Technologies Corp. in Boulder, Colo., and the Thermal Infrared Sensor built by NASA Goddard. 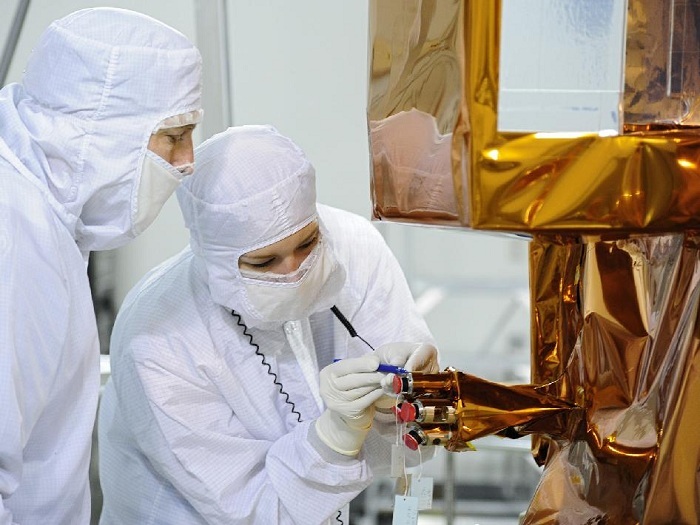 “Both of these instruments have evolutionary advances that make them the most advanced Landsat instruments to date and are designed to improve performance and reliability to improve observations of the global land surface,” said Ken Schwer, LDCM project manager at NASA Goddard. Earlier in December, crews at Vandenberg conducted a fueling exercise for the Atlas 5 rocket. The most recent spacecraft in this series, the Landsat-7 satellite, headed to space April 15, 1999, aboard a Delta 2 rocket that launched from Vandenberg. 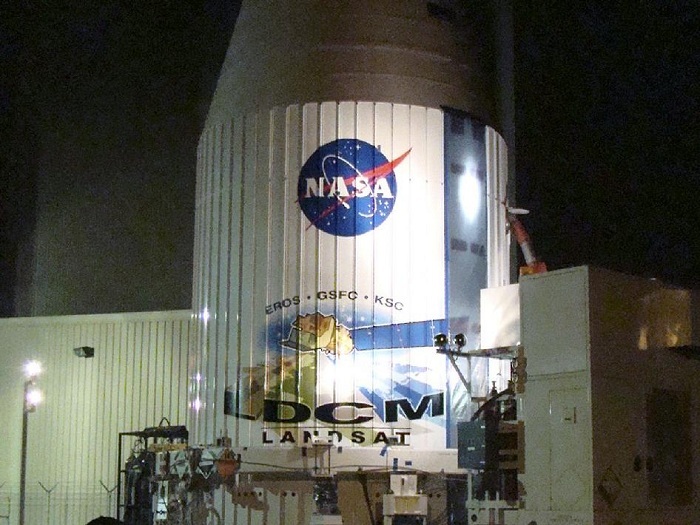 NASA's Landsat Data Continuity Mission (LDCM) is scheduled to launch Feb. 11 from Vandenberg Air Force Base in California. A joint NASA and U.S. Geological Survey (USGS) mission, LDCM will add to the longest continuous data record of Earth's surface as viewed from space. LDCM is the eighth satellite in the Landsat series, which began in 1972. The mission will extend more than 40 years of global land observations that are critical in many areas, such as energy and water management, forest monitoring, human and environmental health, urban planning, disaster recovery and agriculture. NASA and the USGS jointly manage the Landsat Program. "For decades, Landsat has played an important part in NASA's mission to advance Earth system science. LDCM promises to extend and expand that capability," said Michael Freilich, director of the Earth Science Division in the Science Mission Directorate at NASA Headquarters in Washington. "USGS's policy of offering free and open access to the phenomenal 40-year Landsat data record will continue to give the United States and global research community a better understanding of the changes occurring on our planet." After launch, LDCM will enter a polar orbit, circling Earth about 14 times daily from an altitude of 438 miles (705 kilometers), returning over each location on Earth every 16 days. After launch and the initial checkout phase, the USGS will take operational control of the satellite, and LDCM will be renamed Landsat 8. Data will be downlinked to three ground stations in Gilmore Creek, Alaska; Svalbard, Norway; and Sioux Falls, S.D. The data will be archived and distributed at no cost to users from the USGS's Earth Resources Observation and Science Center in Sioux Falls. "The Landsat program provides the nation with crucial, impartial data about its natural resources," said Matthew Larsen, USGS associate director for climate and land use change in Reston, Va. "Forest managers, for instance, use Landsat's recurring imagery to monitor the status of woodlands in near real-time. Landsat-based approaches also now are being used in most western states for cost-effective allocation of water for irrigation. This mission will continue that vital role." LDCM carries two instruments, the Operational Land Imager (OLI), built by Ball Aerospace & Technologies Corp. in Boulder, Colo., and the Thermal Infrared Sensor (TIRS), built by NASA's Goddard Space Flight Center in Greenbelt, Md. 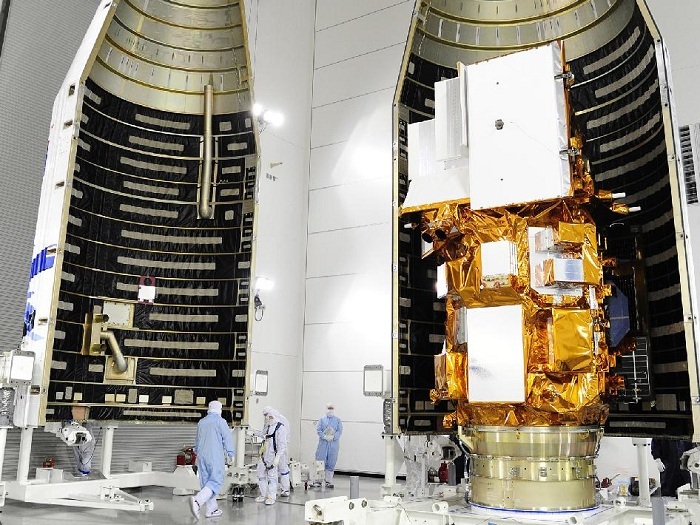 These instruments are designed to improve performance and reliability over previous Landsat sensors. 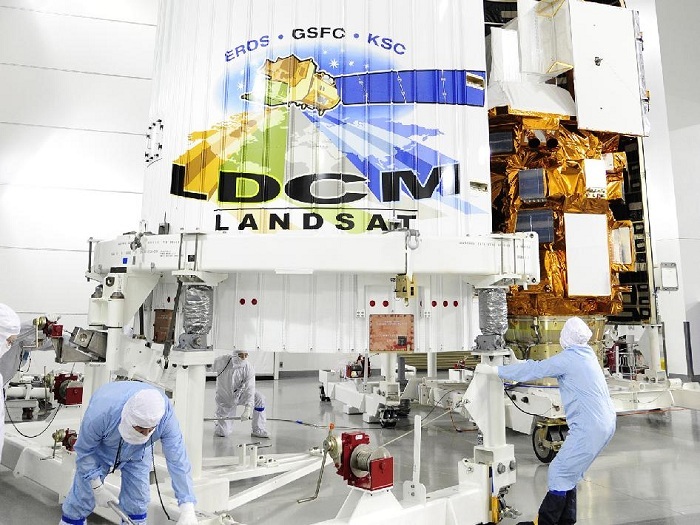 "LDCM will be the best Landsat satellite yet launched in terms of the quality and quantity of the data collected by the LDCM sensors," said Jim Irons, LDCM project scientist at Goddard. "OLI and TIRS both employ technological advances that will make the observations more sensitive to the variation across the landscape and to changes in the land surface over time." OLI will continue observations currently made by Landsat 7 in the visible, near infrared and shortwave infrared portions of the electromagnetic spectrum. It also will take measurements in two new bands, one to observe high altitude cirrus clouds and one to observe water quality in lakes and shallow coastal oceans as well as aerosols. OLI's new design has fewer moving parts than previous versions. TIRS will collect data on heat emitted from Earth's surface in two thermal bands, as opposed to the single thermal band on previous Landsat satellites. Observations in the thermal bands are vital to monitoring water consumption, especially in the arid western United States. The LDCM spacecraft, built by Orbital Sciences Corp. in Gilbert, Ariz., will launch from Vandenberg's Space Complex 3 aboard an Atlas V rocket provided by United Launch Alliance. NASA's Launch Services Program at Kennedy Space Center is responsible for launch management. 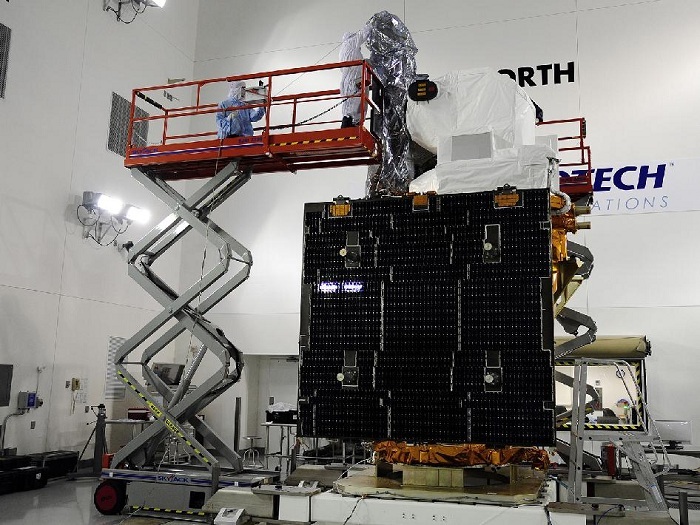 Technicians inspect NASA's Landsat Data Continuity Mission, or LDCM, satellite at the Astrotech facility at Vandenberg Air Force Base in California where it will undergo prelaunch processing. Following fueling operations, technicians inspect the Landsat Data Continuity Mission (LDCM) spacecraft in the Astrotech processing facility at Vandenberg Air Force Base in California. Technicians encapsulate the NASA's Landsat Data Continuity Mission (LDCM) satellite in its payload fairing in the Astrotech processing facility at Vandenberg Air Force Base in California. In his first visit to his agency’s western spaceport, NASA Administrator Charles F. Bolden Jr. declared himself “giddy” about today’s planned Atlas 5 rocket launch of an Earth-observing satellite. “I’m sort of like a kid, I’m kind of giddy about it,” Bolden, a former astronaut on four shuttle missions and a retired Marine Corps major general, said while standing in front of the rocket at Vandenberg Air Force Base on Sunday. Bolden traveled west for today’s scheduled launch of an Atlas 5 rocket carrying NASA’s Landsat Data Continuity Mission spacecraft to observe Earth. Sunday afternoon, he saw the United Launch Alliance Atlas 5 rocket tucked inside Space Launch Complex-3 on South Base. Liftoff is planned for 10:02 a.m. today but the team has until 10:50 a.m. to get the rocket off the ground or postpone its departure to try another day. This will be the eighth Landsat craft to launch from Vandenberg, continuing a 40-year archive of Earth images. NASA officials have said the mission costs $855 million. “I think Landsat has played a huge role to help other people explore our Earth in ways that they could not before,” Bolden said. He was accompanied by Anne Castle, the Interior Department's assistant secretary for water and science, who hailed the crucial role Landsat has played throughout the years and the importance of continuing to gather those images from space. Yet, future Landsat craft remain uncertain and unfunded. Landsat 7 continues to operate but only has a few more years of fuel left. Landsat 6 never reached orbit and Landsat 5 was recently retired after a record-setting 29 years of observations. “It’s very important to have an operational Landsat program so that we minimize the risk of the data gap,” Castle said, adding that the program needs a launch schedule to avoid a lapse in the Landsat image archives. Talks have taken place with officials on Capitol Hill and at other levels that the program needs to continue beyond LDCM, she noted. “We’re hopeful that with a successful launch (today) that that will be the platform for the next generation of Landsat satellites,” Castle said. “I echo what was just said about the importance of continuing this mission,” Bolden added. Landsat involves a partnership between NASA and the Interior Department, a relationship that “will continue to give us the tools to better manage our natural resources and to preserve the Earth for future generations,” Castle said. From climate change to other areas, Landsat delivers valuable data that isn’t otherwise available to scientific and other communities, she added. “We can see changes in the course of rivers,” Castle said. “We can observe the marks of wildfire. With the thermal imagery we can see how energy is used and stored. We can see how water is consumed and evaporated. Landsat data, once only available for sale, now is free, which has only led to expanded and increased usage across the globe, while creating a common database for researchers around the world. In the middle of a press conference Sunday, Bolden became momentarily distracted by the 200-foot-tall rocket tucked inside the gantry behind him. “I was just saying ‘shucks, I forgot to turn around and look at the rocket,” he noted. Bolden said he plans to remain NASA’s leader — as long as President Barack Obama wants him to stay through his second term.